Alarm Clocks Online is pretty much the no-brainer choice when you want an alarm clock, and you want to get it online. See how logical that is? The only way our name could be more accurate is if we became "Affordable and Awesome Alarm Clocks Online," but we figure we'll let you discover the affordability and awesomeness on your own. We carry the most incredible selection of alarm clocks in virtually every possible shape and style, with every conceivable functionality. From old school analog and two bell ringer styles to high tech science fiction models that answer to your verbal commands, project the time on the ceiling and measure the ambient temperature outside, you know, in case you like to sleep in a bit longer when it gets a little colder out. 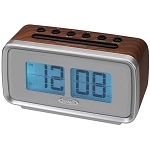 Our dual alarm clocks are the perfect solution for the couple who works different schedules, but doesn't want the clutter of having two alarm clocks on the bedside table. Our dual alarm clock selection features the sleek and streamlined black profile Jensen Auto Set alarm clock, which not only has the big and bold jumbo display with the finely tuned Jensen AM/FM radio, but also automatically sets itself to the correct time in case of a power outage. Simply click on the clock image you like, and our easy ordering system takes care of the rest. If we can assist with your search for the perfect alarm clock, please call us at our toll-free number, 1-888-925-3878, so we can show off our impressive customer service!